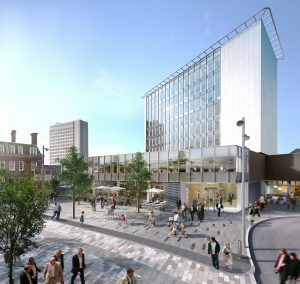 WORK on delivering a new ‘gateway’ into Woking Town Centre near the railway station has begun. The transformation of the Albion House mixed-use site is to be renamed Woking One, with eight floors of new office space including a reception area in front of the station piazza. Developers Wenbridge Land & Palmer Capital said the 65,000sq ft development, due to be completed in February 2018, will include 34,000sq ft of offices, 14,500sq ft of restaurant space and a mix of flats and shops. They say the it will attract new jobs and amenities and that convenience of fast rail connections to London will be a major draw. The first restaurant to book space in the development is Limeyard, which describes itself as an ‘all day American kitchen’. Alongside Woking One, with eight floors of office space, will be the £460 million Victoria Square development, inlcuding 391 apartments and a new Marks & Spencer. Another nearby development includes the residential Prime Place on Goldsworth Road, a 34-storey skyscraper containing 560 apartments. “The proximity to the station means that Woking One is positioned to offer unrivalled connectivity to London from Woking. The journey time by rail to the City is only 24 minutes.